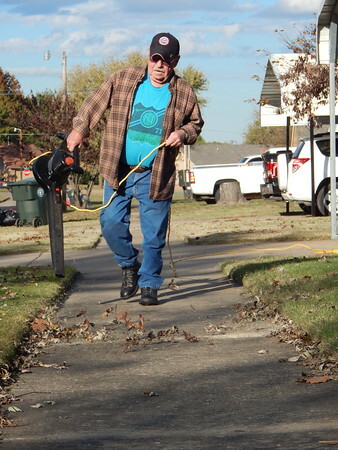 Jack Bartholomew blows leaves from his sidewalk in south Muskogee on Monday afternoon. He said he blows leaves and grass clippings into his lawn to use as mulch. The weather should be ideal for leaf blowing and other lawn chores for most of the week. According to AccuWeather Muskogee, a severe thunderstorm is expected Wednesday morning. Otherwise, expect sunshine and cool fall temperatures.